When we got engaged, my friend Mallory sent us our first engagement gift. It was a joke gift, she said. (If you haven't seen it, you can check it out here). We had it sitting on our table for months. When my brother and his girlfriend got engaged in December, I knew exactly what to give them: Mallory's gag gift. So I took some wrapping paper and ribbon and wrapped it up, never mentioning to Mallory that the gift was taking a trip to another engaged couple. Mallory texted me the next day. "Do you still have that engagement gift I sent you?" she asked. I looked over at my wrapped gift wondering if she wanted it back after I had it for over a year. She then told me an idea her mom had given her. And, since I thought it was a fantastic idea, I unwrapped the gift to follow the instructions. 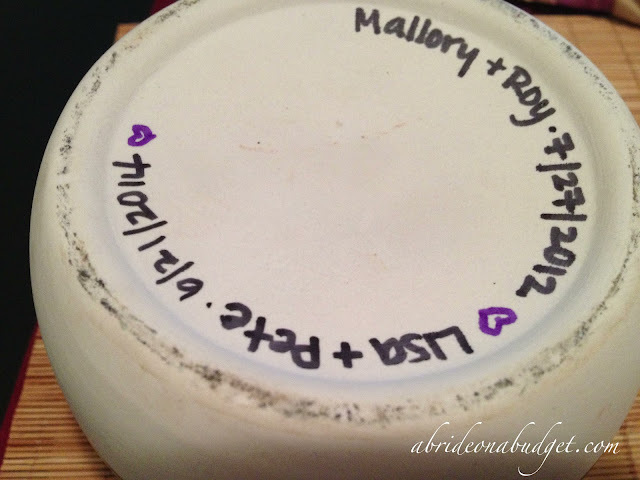 She told me write Mallory and her husband's name at the bottom, followed by their wedding date. She then told me to write our names at the bottom followed by our wedding date. My brother and his fiance would follow with their names and wedding date, on and on until the gag gift stopped making its rounds. It went from gag gift to incredibly sentimental gift with just a few permanent ink markers. BRIDAL BABBLE: Do you have any engagement traditions in your family? This is really cool. A new tradition in the making! No engagement traditions here, but I love the concept of creating a sentimental keepsake like this. I like this gift. 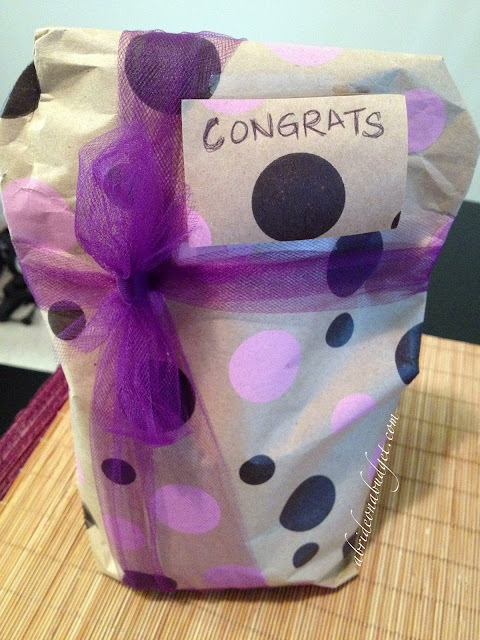 A great way to remember friends and their engagements. What a great idea! It truly did go from 'gag gift' to personal/sentimental! Mazel to ALL the couples!